The advantages of having your own swimming pool are well known. Not only will a pool provide hours of fun creating a lifetime of memories, but the right pool will increase the value of your property. Whether it’s in-ground or semi in ground skimmer or overflow , a stunning infinity pool, lap pool or a small plunge pool, a pool offers provides hours of amusement right in your backyard. Here are a few tips that are sure to create a splash when designing your awe-inspiring swimming pool! The type of pool you build will be based on the size of the space and budget you are working with and what you plan on using your pool for. Will you be swimming laps or are you just looking for a place to take a dip during those hot summer months? 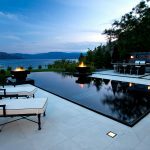 From infinity pools that expand your horizon, to plunge pools that save space and traditional pools alike, as you design your pool be sure to keep in mind the aesthetic and style of your home. For those working with minimal space, a smaller plunge pool may be the ideal option. For those with more space, an endless infinity pool will not only enhance the look and feel of your yard but it also increases your property value. You can even get creative and add a hot tub spa to your pool design! 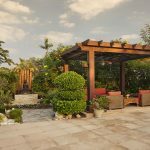 Ultimately, your pool should enhance the existing design of your space while giving you a place to relax and entertain in comforts of your yard. Today, most people avoid the traditional rectangular design for their swimming pools. While functional, they are common and can come across as boring. When designing your pool, think outside of the box! When you select the right shape for your pool, you will enhance the aesthetics of your space. Consider an oval, circular or even square shaped pool. Depending on the size of your pool area, you can even use a combination of shapes. Who will be using the pool? Does anyone plan on swimming laps in the pool? Are you planning on entertaining with the pool? How you answer these questions will help you determine the size and shape that best suits your pool needs. Whether you are a seasoned swimmer or simply looking to provide a space for your family to enjoy during the warmer months, you must be aware of safety issues and recommendations when designing your indoor pool. We recommend paying close attention to the flooring that surrounds your pool and to choose something that is practical and comfortable for swimmers. Slate flooring is not only water-resistant, but it’s also durable and is an ideal option for a room that leads directly to a pool area. Composite wooden deck is non slippery and not hot to land your feet on. Another alternative is outdoor ceramic non slip tiles. . As long as the tiles and floors are not polished smooth, cement tiles provide a great look for your pool that’s functional and safe. If you are building an indoor pool, be sure to make the pool close to an exit. In doing so, you will effortlessly connect your indoor pool to the external area, such as your outdoor kitchen or garden area. This can be as simple as adding a French window or a door to complement the pleasure of swimming and relaxing in your pool. Adding customized lighting fixtures, water fountains, and decorative ceiling art can go a long way in taking your indoor pool to the next level of awe-inspiring. Adding a waterfall with some mood lighting will truly create a space that you won’t want to leave. You can even take it one step further by painting a stunning mural on the ceiling. 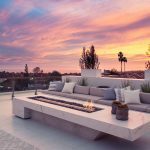 All of these added visuals will not only add value to your home, but they will create an indoor oasis that will get you through those cold and rainy days. Perhaps the most important element to design your dream swimming pool space is to be brave and experiment! Think about all the fun events you will center around your pool. Think about how creative details such waterfalls and fountains will contribute to that joyful experience. Will you be adding other entertainment pieces to the area, such as a tennis table or television? By the time you think of all the elements you want to add to your pool area you’ll be loving your pool long before it’s built!